Giacometti was born in Borgonovo, now part of the Switzerland municipality of Bregaglia, near the Italian border. He was a descendant of Protestant refugees escaping the inquisition. Alberto attended the Geneva School of Fine Arts. His brothers Diego (1902–85) and Bruno (1907–2012) would go on to become artists as well. Additionally, Zaccaria Giacometti, later professor of constitutional law and chancellor of the University of Zurich, grew up together with them, having been orphaned at the age of 12 in 1905. Between 1936 and 1940, Giacometti concentrated his sculpting on the human head, focusing on the sitter's gaze. He preferred models he was close to—his sister and the artist Isabel Rawsthorne (then known as Isabel Delmer). This was followed by a phase in which his statues of Isabel became stretched out; her limbs elongated. Obsessed with creating his sculptures exactly as he envisioned through his unique view of reality, he often carved until they were as thin as nails and reduced to the size of a pack of cigarettes, much to his consternation. A friend of his once said that if Giacometti decided to sculpt you, "he would make your head look like the blade of a knife". After his marriage to Annette Arm in 1946 his tiny sculptures became larger, but the larger they grew, the thinner they became. Giacometti said that the final result represented the sensation he felt when he looked at a woman. His paintings underwent a parallel procedure. The figures appear isolated and severely attenuated, as the result of continuous reworking. Subjects were frequently revisited: one of his favorite models was his younger brother Diego Giacometti. A third brother, Bruno Giacometti, was a noted architect. Three Men Walking II, 1949, painted bronze sculpture Metropolitan Museum of Art. "The surfaces of Three Men Walking (II), 1949, typify his technique." In his later years Giacometti's works were shown in a number of large exhibitions throughout Europe. Riding a wave of international popularity, and despite his declining health, he travelled to the United States in 1965 for an exhibition of his works at the Museum of Modern Art in New York. As his last work he prepared the text for the book Paris sans fin, a sequence of 150 lithographs containing memories of all the places where he had lived. Giacometti died in 1966 of heart disease (pericarditis) and chronic bronchitis at the Kantonsspital in Chur, Switzerland. His body was returned to his birthplace in Borgonovo, where he was interred close to his parents. In May 2007 the executor of his widow's estate, former French foreign minister Roland Dumas, was convicted of illegally selling Giacometti's works to a top auctioneer, Jacques Tajan, who was also convicted. Both were ordered to pay €850,000 to the Alberto and Annette Giacometti Foundation. 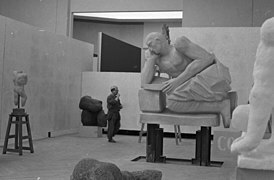 Scholar William Barrett in Irrational Man: A Study in Existential Philosophy (1962), argues that the attenuated forms of Giacometti's figures reflect the view of 20th century modernism and existentialism that modern life is increasingly empty and devoid of meaning. "All the sculptures of today, like those of the past, will end one day in pieces...So it is important to fashion ones work carefully in its smallest recess and charge every particle of matter with life." L'Homme au doigt (Pointing Man) sold for $126 million (£81314455.32), or $141.3 million with fees, in Christie's May 11, 2015 Looking Forward to the Past sale in New York, a record for a sculpture at auction. The work had been in the same private collection for 45 years. ^ Luke, Ben (13 October 2015). "Giacometti: Pure Presence, exhibition review: Profound portrait of the artist’s progress". Evening Standard online. Retrieved 13 October 2015. ^ Afp.google.com, Monet fetches record price at New York auction Archived 2008-05-12 at the Wayback Machine.